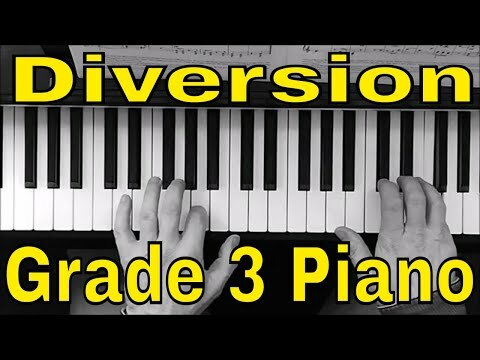 Grade 3 Piano ABRSM 2019/2020 C2. First of all, note the composer's marking "Giocoso". The tempo must be lively enough to convey the joyful mood of this piece. Although Richard Rodney Bennett prescribes a metronome mark of crotchet = 80, note that in the footnote of the ABRSM edition, it mentions that crotchet = 72 would be suitable for examination purposes. One of the main things that will bring out the character of this piece is careful articulation. Notice precisely where notes are marked slurred or staccato, remembering that the last note of any slurred group, should always be lifted. It might be tempting to make certain notes staccato where they are not written, for example the first quaver of bars 6, 15 and 31. Also make sure the bass A of bars 15 and 18 is a light staccato, in what is otherwise a more legato section. You will need to be careful of the timing in bars 24-25. It would be very easy here to chop the long note a bar short. The legato 3rds in the LH of bar 37 will need extra care especially since the first top A, is repeated immediately in the RH and so will need to be lifted a fraction earlier without losing the legato effect. Pay attention to the dynamic shaping, especially the subtle up and down waves from bars 17-22. Finally, a really polished performance will require you to be aware of the phrasing. So, for example, there should be a breath between bars 11 and 12, it should not be a legato join between these two bars and in general a slight lean on the first quaver of each bar will help this delightful piece dance along as the composer intended.